In 2000 Belgian band Zornik participated in music magazine Humo's band contest Humo's Rock Rally. It didn't take long for them to release their first album. They were all over the hit parades in their own country since then. Their bombastic and emotional rock music, which reminds of Muse now and then, never really made it outside Belgium. But on their home ground they kept scoring. More successful albums followed and shows at any stage in the neighbourhood. In 2008 they decided to take a sabbatical. With Less > More that break has ended. But they don't continue down the same road. Apparently the break has led to a moment of reflection. 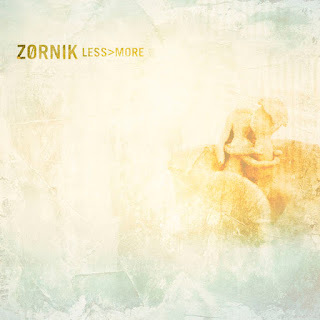 Like on their acoustic album Alien Sweetheart from 2005, we mostly hear the modest side of Zornik and singer Koen Buyse. This may not be easy for anyone who likes the more rough music of the band, which made them stick out in the first place. But this more quiet side sounds good as well. Often the songs are kind of Beatlesque. You can hear this in the reeling and summery 'Smiling In The Sun'. A song that is reminding of Dutch band Johan. Besides more of these kind of songs, the records also holds a few slow melancholic tracks. Those sound a lot alike though. 'I Wonder Why' is breaking out of this somewhat, by taking it up a few notches at the end. But the band is mostly taking it slow. They are showing to be full of musicality and every song is a skilful composition. Still you kind of hope that it will go wild now and then like in the old days. This doesn't happen and the record closes with the sad 'Anybody Else'. It seems Zornik has transformed from young dog into a thoughtful adult the past decade. That's not a problem and it regularly results in beautiful compositions. Still you keep thinking about those early days, when the band impressed with their characteristic rock sound. Maybe in the future those quiet songs can alternate with a few solid rockers, so we can get the best of both worlds. In this case "less" just isn't enough. It's time for Zornik to get a midlife crisis. Listen to Less > More on Spotify.